I'm currently working on a new Django project which relies heavily on Celery. I normally use RabbitMQ for these kinds of projects but I decided to give Amazon SQS a try this time as it's very cheap and will simplify my setup. I had been using Shelfari for a few years to keep track of books I've read and plan to read. 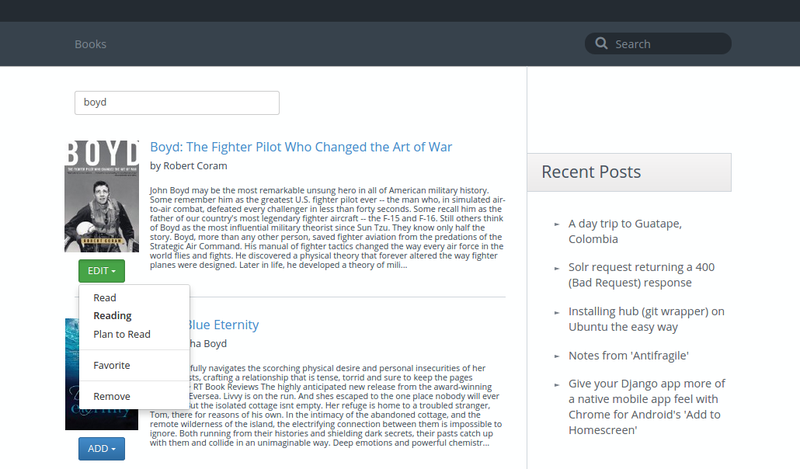 I really liked the website's interface and they had this nice widget that lets you display a bookshelf of your reading list on your blog. But when I forced SSL on my blog, it stopped working. The widget doesn't work over https. Here’s a very simple Python script I currently use to create a compressed PostgreSQL database backup for my Django app. Since my database is very small and I don’t see it becoming big anytime soon, I create the backup locally and send a copy to Amazon S3.